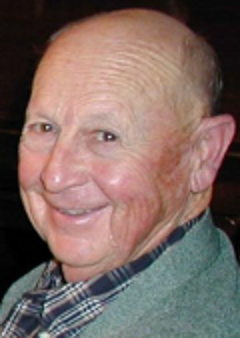 Lake Forest, California – John Robert Baab, 90, left this life on Thursday, December 21, 2017, at Freedom Village retirement community. He is survived by his wife of 62 years, Marilyn; his son, David, and daughter-in-law, Katherine, and their son, Christopher – residents of Tustin, California; his son, Ben, and daughter-in-law, Martha, - residents of Lafayette, California, their daughter, Caroline, a resident of Anagance, New Brunswick, Canada, and their son, Will, a resident of El Cerrito, California. John had many nieces and nephews, and grandnieces and nephews who fondly called him Uncle John. He enjoyed many friendships throughout California: at Freedom Village in Lake Forest, at The Groves retirement community in Irvine, at Red Hill Lutheran Church in Tustin, and at Our Savior’s Lutheran Church in Lafayette. John was born on December 7, 1927, in Dayton, Ohio, to Carl B. Baab and Freda A. Baab. He grew up around the Dayton area and graduated from Northridge High School in 1946. Upon graduation, he joined the US Navy and was stationed on the submarine tender, USS Bushnell, out of Pearl Harbor, Hawaii. His tour of duty included time in the Marshall Islands during the testing of atomic bombs. He was honorably discharged in 1948. John attended college, the first of his family, at Capital University in Columbus, Ohio. His days at Capital were interrupted between 1950 and 1952 when he was recalled to serve in the Navy due to the Korean conflict. He was stationed at North Island, San Diego, California, and was honorably discharged again in 1952. He graduated from Capital University with a Bachelor of Science in Education in 1954; and then earned a Master of Education degree from Miami University of Ohio in 1956. John’s teaching career began at Highview Elementary in Dayton, Ohio, in 1954. His first assignment was a combined 7th/8th grade class. While there, John met, courted, and married one of the 1st grade teachers, Marilyn Demmler from Dayton. John’s career in education included several years as an elementary school principal in Ohio and California. After he retired from full-time teaching in 1981, John supported the growth and nurturing of all three grandchildren as their dear Papa John, first living in the Bay Area in the early 1990s to be close to Caroline and Will; and then, since 1997, in Southern California to be close to Chris. John’s passions included his wife, Marilyn; traveling, especially cruises and long driving trips; gardening; singing karaoke; being the first on the dance floor; helping his neighbors; making strangers feel welcome; taking long walks; and enjoying an active worship life: leading classes at Bible Study Fellowship in Newport Beach, volunteering at Rancho Santa Marta children’s home in Baja California, participating in numerous work parties, and being quick to tell others that God loves them. His smile and the sparkle in his eye will be missed.